As it runs for two days, consider waiting for the Auto refresh...Second play rewards are weaker than first play in Assault Battles. Yeh I figure that but I notice its a pretty hefty refresh cost so I'm thinking it may be worth it! What you think about that possibility? A guy in my guild refreshed and got 200K ship credits, 4 fives blueprints, 5 rex shards and 3 carbantia gel salvage... probably not worth it. The fights in this one felt a bit better than some of the other ones though. Between the leaders each round and then kenobi and yoda at the end i found myself at least thinking about who I was stunning, shocking, and ability blocking. I feel tier two was generally weaker than tier one for the first seven levels. Level 8 though...Yoda is a speed demon! All I can say is, better call Zaul. I'm sure quite a few people are interested in how to beat this event. If you are G11 with Zeta leads, I'm sure you were able to auto it. But to provide a starting point, why don't we post what group we brought to the table to win. For myself, I tried maybe 10 times with various combination of FO and sith and ALWAYS got wrecked at the final stage. I was about to just call it a day, and maybe try again once Nihilus unlocked, but then I thought, eh, one more try ... ON AUTO. So I took my crew of Darth Maul as leader (G8), Emp Palp (G8), Phasma (G8), FOO (G9), and Kylo (G10), and hit auto. All characters are level 85 except for Mr Maul, who is 80. Then I plugged my phone in and watched a bit of the basketball game. When I looked back ... my group was on stage 8, and Kenobi was DOWN. I watched, a bit stunned, as my team brought home the gold. The rewards were a bit underwhelming (I'm happy to report I got my 951st Mk 4 stun gun! ), but the ship credits were nice, as were the 10 Vader shards as an achievement. 36 to go. So ... who did you win with? I prayed real hard and used Maul lead with Palpatine, Sidius, phasma,kuloren. In other news, I'm happy to report I'm the proud owner of my 1475th Mk 5 SoroSuub Keypad Salvage! Wow this places of power event is great! A+++ we got stun cuffs! And it was 3 tiers! Nice rewards! Jedi event worth a refresh? Is it worth 225?? On more than one occasion Vaders ability block on basic failed to land, when it says Jedi cannot evade or resist this effect, bit the one I found interesting was on the 8th battle of tier 3 I used savages special to take out gk, once savage landed back in place from his kill shot he was immediately stunned and no one else had attacked, am I missing something? Or is this some weird bug? 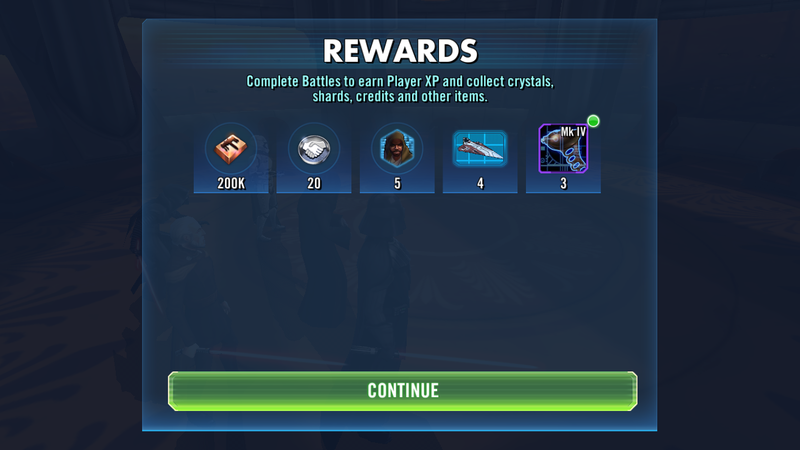 PS: thank you EA/CG for the great event, the rewards were very nice! And I found the event to be very fun! Just saved me 225, thanks! Stop buffing event toons beyond comprehension. Yoda should not have a base speed that allows him 3 moves before any one of mine. Enough. Stop it. Cut the ****. It's getting old. My team is full of G10 toons. Palp lead with vader, sidious, SO, phasma. All decently modded. Yet when i hit the last stage of second tier I get wiped out because I can get a **** move in. STOP BUFFING TOONS BEYOND WHAT WE CAN GET OURSELVES DEVS! Would you mind telling us you team? Cause my maul basically cleaned the floor with everyone, zader and palp just made it hard to see what was going on. So trying to beat places of power and I noticed on I believe 4/8 stage 1, 5's is double tapping on slowed enemies. He is also showing being only level 75. Correct me if I am wrong, but 5's doesn't get that ability until level 76 or 80. If they did this for this one extremely noticeable ability, how many other abilities are over-clocked above the npc teams? If you are going to make it too difficult to beat with a level 80+ gear 9+ squad at least have the decency to give the npc's abilities appropriate to their level, or show the real level of the npc's. Ps it's not that I can't beat the event. It is about the blatant over-clocked abilities on toons showing levels that do not match their levels, or for that matter the gear level being higher than the obtainable level of the level of the npc.